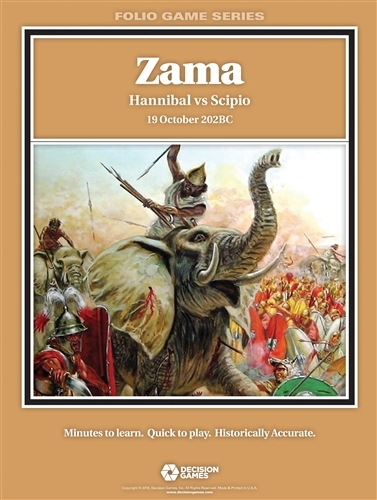 Zama is a simulation of the climactic battle of the Second Punic War: the decisive struggle between the Roman Republic and Carthage for control of the Western Mediterranean. The war began in 218 BC, with the Carthaginians led by Hannibal, one of history’s greatest commanders. The two nations clashed for over a decade, with each experiencing triumphs and defeats. Following the Battle of the Great Plains in 203 BC, a ceasefire was negotiated. It was broken following a Carthaginian attack on a stranded Roman fleet in the Gulf of Tunis. Determined to finally win the war, Roman General Scipio Africanus led an invasion force into North Africa, the Carthaginian homeland. 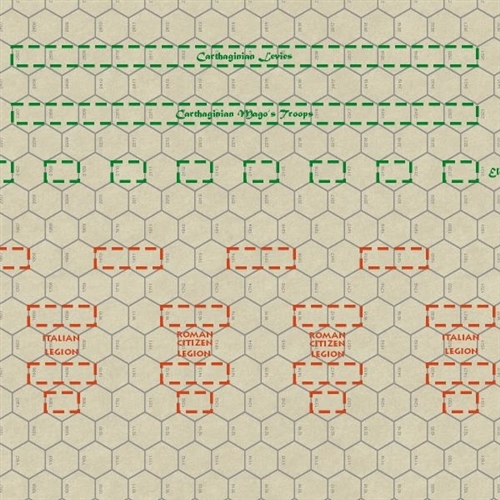 The opposing armies met near the town of Zama. Despite being outnumbered, the Romans were able to defeat the Carthaginians. With that victory the Romans had effectively won the war. 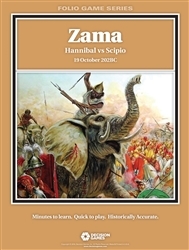 Zama is part of DG’s Battles of the Ancient World series, that emphasizes simple but realistic design features to show critical aspects of classical era combat. Special rules for leadership, missile fire, and elephants are included. Contents: 17"x22" terrain map, 100 die-cut counters, one Standard & Exclusive Rules booklet. 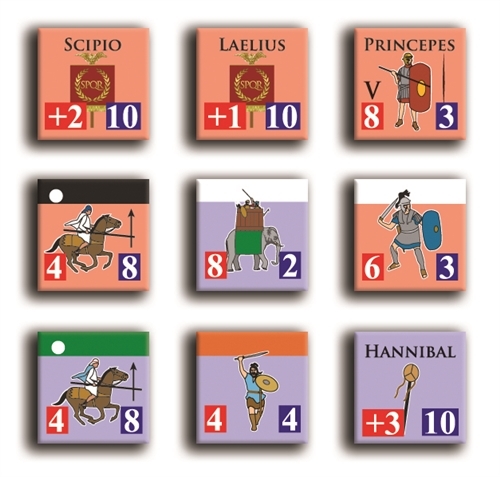 Gamers if you hate Carthaginians like I hate them this is your game. Seriously this is a slug match and I just started out with a game and then read the rules during 3 subsequent fights and you will find that either side can win. If you do not get the elephants to go â€œberserkâ€ they can do damage. Remember Caesars 10th and Paulus’s 14th Gemini Legions or the 6th Gallica who stood with Caesar in Cairo is not in this era. These Legions are real citizens fighting against merc’s. Fun game if you like to whack a unit â€œeliminatedâ€ instead of retreat 3 paces and maybe lose a step or retreat or no effect. It is more like one of the first games Decision did with Napoleon at Waterloo where that was a slug fest, but with guns.